Schmitt, Rüdiger. 2016. Iranisches Personennamenbuch Band 2/Faszikel 5: Personennamen in parthischen epigraphischen Quellen. (Österreichische Akademie Der Wissenschaften. Philosophisch-Historische Klasse; Iranische Onomastik 15). Wien: Verlag der Österreichischen Akademie der Wissenschaften (ÖAW). 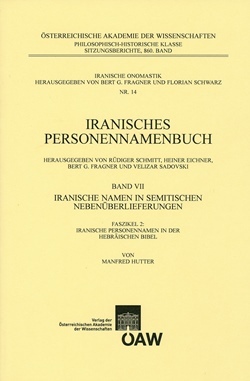 This volume of the Iranisches Personennamenbuch (Lexicon of Iranian personal names) presents a full collection of the personal names attested between 150 BCE and 300 CE in Parthian epigraphical sources, inclusive of patronymics and family names as well as the topographical names derived from personal names. Also non-Parthian and even non-Iranian (Semitic, Latin, etc.) personal names are taken into account, as they are part of the onomastic material attested in an Iranian language. The presentation of the names in principle is the same as in the earlier volumes of the Iranisches Personennamenbuch: First comes a full listing of all references (with the kind of the text and its provenance given in abbreviated form), then a sketchy prosopographical characterisation of the person(s) bearing the name, and finally the section on the morphological and etymological interpretation of the name, in which a cautious judgement is attempted. Here the names attested in the Old Iranian and the other Middle Iranian languages (together with their collateral tradition), now known in much greater numbers than at the time of Ferdinand Justi’s Iranisches Namenbuch (1895), are quoted in a fitting manner. Full indexes make all the names accessible that are quoted by way of comparison. Rüdiger Schmitt ist emer. Professor für Vergleichende Indogermanische Sprachwissenschaft und Indoiranistik der Universität des Saarlandes, Saarbrücken.